The question I received from C. is: Why do I feel the need to hold onto this relationship with mr. M when he claims to love me, but won’t commit? XIX – the Sun – You in this relationship with M. You feel comfortable as you are complementing each other quite nicely in this relationship. You are good partners and you share a lot of interests, being a bit like kin. You are rather friends than passionate lovers. Still, this relationship has brought each of you quite a lot! Could it be that you hit a plateau? XIII – the Arcanum without a name or Death – drawn as an explanation for the Sun arcanum, this arcanum confirms the fact that there is a need felt for going to the next stage of the relationship, a complete transformation and re-invention. This happens quite brutal and even dramatic. Could you make it through together? Or does it mean parting ways? This is something that only you two can negotiate. IX – the Ermit – the challenge: You are invited to turn within yourself and to meditate. What kind of relationship do you want to have in your life at the moment? How do you want to feel? These are good questions to put to yourself in this introspection process. You say that M. doesn’t want to commit, while you seem to want that. Then why is this not happening? Maybe he is not the right person to commit with. For sure you have learned a lot from each other, but it might be the case that you two have to part ways, to go on growing. 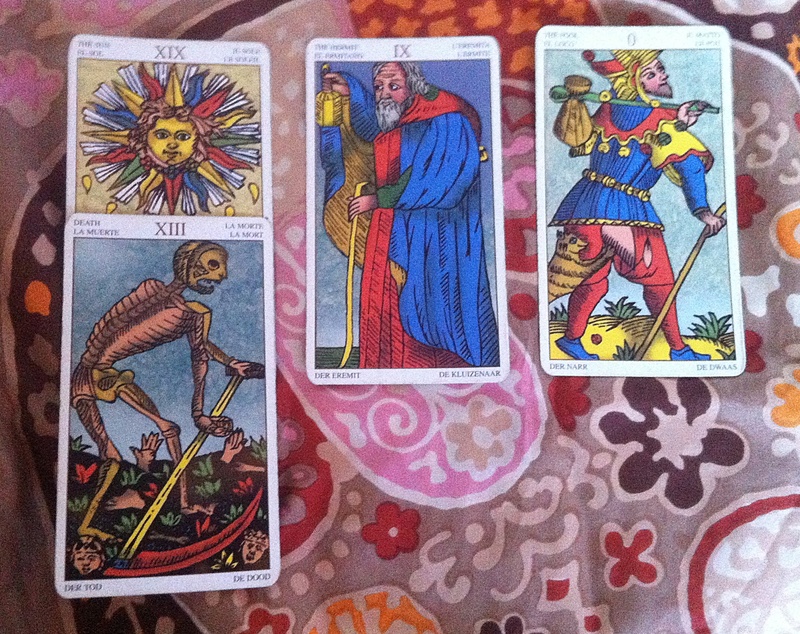 0 – the Fool – the solution card: new beginnings. Whether you decide to go on with this relationship or not, for sure you are entering a new stage of understanding when it comes to inter-personal relationship. You are taking your little bag full of the accumulated wisdom and you are moving on! Will M. come along or not, is up to him. So, looking at the cards and seeing the interaction between them, we can say that what holds you in this relationship is the comfort zone that you two guys have reached. You are comfortable with one another, but as you formulated your question, you are definitely ready to go to the next level of commitment. What will you choose? With M. or not?